Vše ohledně QNAP firmwarů - stabilní i beta verze. Na světě je nový firmware v Beta 2 verzi (pro testovací účely): "4.3.5.0691". Stažení poslední verze firmware QTS je nyní možné jako vždy v sekci "Centrum stahování". - The RADVD service previously did not have an outgoing interface. Please reconfigure the RADVD service after upgrading. - Due to security concerns, support for "Wi-Fi ad-hoc mode" has been removed. - This QTS update changes the file system of the system partition to ext4 for ARM-based models with Annapurna Labs processors. For data security reasons, you are not able to downgrade QTS to a previous version after this update. Affected models: TS-131P, TS-231P, TS-431P, TS-531P, TS-231+, TS-431+, TS-231P2, TS-431P2, TS-431X, TS-431X2, TS-531X, TS-831X, TS-1231XU-RP, TS-1231XU, TS-831XU-RP, TS-831XU, TS-431XU-RP, TS-431XU, TS-431XeU, and TS-1635. - Due to the limitations of future kernel updates, QTS 4.3.5 is the final available QTS update for the following NAS models: TS-EC1679U-SAS-RP, TS-EC1679U-RP, TS-1679U-RP, TS-EC1279U-SAS-RP, TS-EC1279U-RP, TS-1279U-RP, TS-1079 Pro, TS-EC879U-RP, TS-879U-RP, TS-1270U-RP, TS-870U-RP, TS-470U-RP, TS-470U-SP, TS-879 Pro, TVS-870, TS-870 Pro, TS-870, TVS-670, TS-670 Pro, TS-670, TVS-470, TS-470 Pro, and TS-470. - Due to the limitations of non-expandable memory capacity and 32-bit processor architecture, starting from QTS 4.3.5, the TS-128 and TS-228 no longer support Container Station and all the dependent applications, including Notes Station 3, Qcontactz, QcalAgent, AWS Greengrass, and QIoT Suite Life. - Added support for Panasonic Blu-ray archival devices. - Added QNAP Hybrid Archival Manager. - Upgraded the Remote Mount service. It now supports SMBv2 and SMBv3. - After installing Image2PDF, users can access Image2PDF functions directly from the context menu when selecting images. 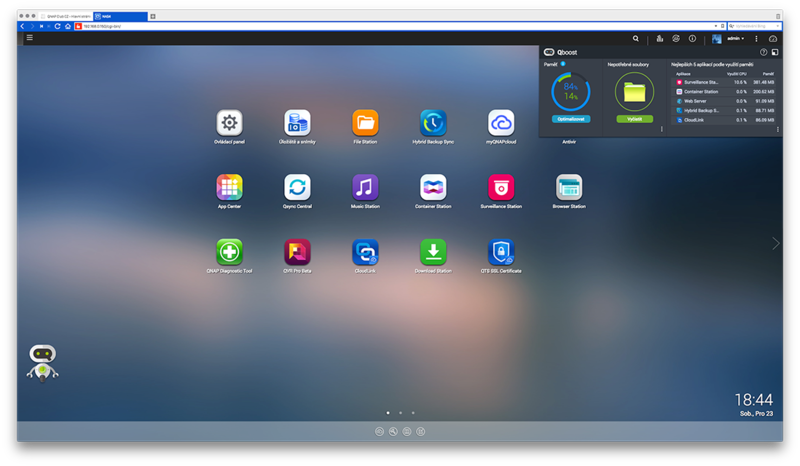 - HD Station apps can now be installed and managed directly through the QTS App Center. - Added cloud installation support through IPv6. - Added support for DLNA Media Server. - Added a software-defined switch mode. - Added support for ARM-AL models. - Added support for stateful/stateless auto-configuration of IPv6 addresses. - Each network interface now supports separate IPv6 RADVD services. - Added support for reserved IPs with the IPv4 DHCP service. - Added support for IPv4 ＆ IPv6 static routing. - Added more DDNS service providers. - Added support for customized DDNS. - Allows multiple DDNS service. - Added a network topology map for virtual and physical networking. - Added location information for network and USB-WiFi adapters. - Added VPN/PPPoE connection status to the overview page. - Added support to display smart offload features when using QNAP network adapters. - Moved all system default gateway settings to the interface page. - VPN/PPPoE connections can now be used as the system default gateway. - Updated interface for WiFi connections. - Added support for QNAP PCIe WiFi cards (QWA-AC 2600) in client mode. - Added support for sending notifications via SMS providers, including Nexmo, Twilio, and Clickatell. - Added support for Overview and History in Notification Center. - Added support for 23 languages for notification messages. - Added support for creating custom notification rules to specify notification criteria, including application categories, severity levels, and keywords. - Delivery method and message recipient settings are now more flexible. - Added support for creating multiple notification rules at the same time. - Added support for sending notifications for a single system event. - Added Outlook as an SMTP service option. - Added support for sending notifications via instant messaging applications, including Skype and Facebook Messenger. - Users of certain NAS models can now assign discrete GPU card resources to Container Station (QuAI). - Added support for multiple discrete GPU cards for certain NAS models. - Certain NAS models can now be configured to play music to help users locate their NAS. - Pre-configured the QTS port to 5000/5001 and WebDAV port to 5007/5008 for certain China-specific NAS models. - Enhanced the shutdown process user interface. Users can now monitor the status of running applications as the system shuts down. - Added Microsoft Networking Advanced Options for ABE (access-based enumeration) and ABSE (access-based share enumeration). - After installing Qsirch, Mac users can now use Spotlight to search files in their mounted QNAP NAS. - Added a shared folder backup option. This addresses a known issue in macOS High Sierra 10.13.4 and later versions that prevented QTS users from using Time Machine to back up data from their Mac to their QNAP NAS through SMB shared folders. - One-time snapshots for file-based LUNs are no longer available, as file-based LUNs can now be protected by volume snapshots. - Added support for configuring SSD over-provisioning on SSD RAID groups used for SSD cache, storage pools, and static volumes. - Added support for using RAID 5 and RAID 6 on SSD cache. - Added support for shrinking thick and thin volumes and converting thin volumes to thick volumes. - Added support for write-only SSD cache. - Storage ＆ Snapshots can now perform SSD Trim when creating or enabling SSD cache and when enabling or disabling SSD cache storage. - Snapshot Manager now allows users to browse, restore, and revert snapshots from a remote Snapshot Vault. - Added support for exporting or importing source copies when creating snapshot replica jobs. - Storage ＆ Snapshots now provides support for Seagate IronWolf Health Management (IHM) when compatible Seagate IronWolf drives are detected. - When creating VJBOD, users can now select interfaces that support the iSER protocol (based on RoCE) to enable iSER connection. - Added SSD Profiling Tool. This utility tests SSD storage settings such as over-provisioning to help determine the best SSD configuration for your NAS. - Added LUN Import/Export. This feature enables you to export a snapshot as an image file, which you can use to create or revert a volume/LUN on another QNAP NAS. - You can now detach and then remove a disk from a RAID group of type: RAID 1, 5, 6, 10. - NCSI (Network Connectivity Status Indicator) services can now be disabled. - Network interfaces can now display customized names. - Each network interface now has separate DNS settings. - Added GPU usage statistics in Resource Monitor. - Added symbolic links options in Microsoft Networking Advanced Options. These allow users to use symbolic links to find and open files. - Added a new restriction setting in Microsoft Networking Advanced Options. Newly shipped NAS models are now pre-configured to restrict the access of anonymous users, including the Guest account. - QNAP recommends performing a file system check for all data volumes after updating QTS to 4.3.5 to upgrade the file system for better system performance and stability. - Due to a file system upgrade, NAS models with Annapurna Labs processors no longer support downgrading QTS. - Due to a change in storage architecture, downgrading QTS is no longer allowed when SSD cache is enabled. - Lowered the memory requirement for using Qtier auto tiering. - QTS now automatically flushes SSD cache data and upgrades SSD cache after a QTS update. - Improved the log format of volume, snapshot, and SSD cache features to better integrate with Notification Center. - Users no longer need to wait for cache flushing when taking snapshots for storage spaces where SSD cache is enabled. - Added support for performing space reclamation on encrypted thin volumes. - Added sound effects for snapshots that are taken manually. - Users can now revert snapshots even when less than 10% of storage pool space is available. - Enhanced the efficiency of LUN backup and renamed the feature to "LUN Import/Export". - iSCSI targets and LUNs now have their respective creation wizards. - Added the option to prevent users from recovering files from snapshots using the "Previous Versions" feature in Windows. - Storage ＆ Snapshots now displays a disk's manufacturer, and its capacity in both binary and decimal format. - Storage ＆ Snapshots now displays supported ATA commands and advanced features for SSDs. - QTS increases fan speeds to maximum if the temperature of a disk reaches the temperature warning threshold. - System Event Logs now display the application and category information for log entries. - Added a lock/unlock encrypted volume feature in File Station. - Removed the storage settings from the quick installation wizard. Administrators can still configure the storage settings in QTS. - Added support for IPv4 & IPv6 static routing. - Storage & Snapshots can now perform SSD Trim when creating or enabling SSD cache and when enabling or disabling SSD cache storage. - Storage & Snapshots now provides support for Seagate IronWolf Health Management (IHM) when compatible Seagate IronWolf drives are detected. - Storage & Snapshots now displays a disk's manufacturer, and its capacity in both binary and decimal format. - Storage & Snapshots now displays supported ATA commands and advanced features for SSDs. - Users cannot use Time Machine to back up data from Mac running macOS High Sierra 10.13.4 (or later) to QNAP NAS via SMB shared folders. Note: This is a known issue in Apple macOS High Sierra 10.13.4 (or later). QNAP plans to add a shared folder backup option in upcoming releases to address this issue. In the meantime, we recommend enabling AFP and backing up data from Mac via AFP. For details, see FAQs on the QNAP website. - After adding renamed adapters to a virtual switch, the name would switch back to the original name. - The link to WiFi PCIe cards on the NAS WiFi page was incorrect.